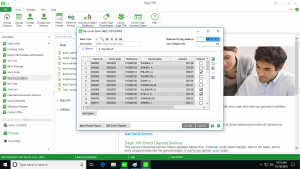 The Sage 100 Bank Reconciliation module allows users to match the transactions in their accounting data with transactions on the bank statement in order to find discrepancies between the two. The reconciliation process can help you locate unrecorded or duplicate transactions and record the changes in a simple, user-friendly manner. This enables you to efficiently manage your reconciliation activities in order to keep your books balanced. Reconcile Bank Accounts: Displayed monthly activity enables you to reconcile bank accounts quickly and easily. Transactions can be confirmed as cleared using a single keystroke. Bank Activity Detail: Bank transaction detail can be retained indefinitely or cleared each month after each account is reconciled. Multiple Bank Accounts: Up to 36 separate bank accounts can be established for a single company. Transactions can be automatically posted from the General Ledger, Accounts Receivable, Accounts Payable, and Payroll modules. Cashflow Analysis: The Estimated Cashflow Analysis Report combines information from the Accounts Receivable, Accounts Payable, and Purchase Order modules to provide an overall cash flow projection for four consecutive periods. Bank Reconciliation Register: All transactions, cleared and outstanding, are listed on this detailed report for each bank account. The Reconciliation Summary shows the adjusted bank balance, computer-calculated book balance, and any out-of-balance amount. Check and Deposit Entry: Transactions not posted automatically through the other integrated modules can be entered manually. Checks, deposits, and adjustments for nonintegrated bank accounts can also be entered manually. 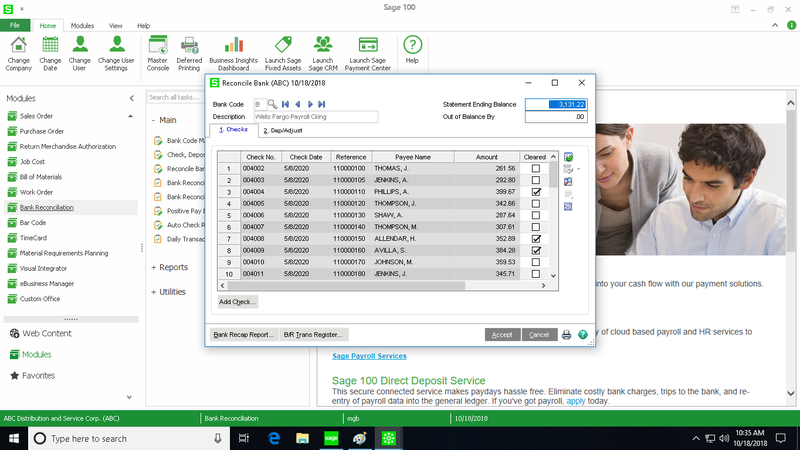 Performing a bank rec in Sage 100 also allows you to pull a reconciliation report, which can provide insight into business performance and other financial activity. Other reports included in this module include the Bank Reconciliation Register, the Bank Transaction Recap Report, and Estimated Cash Flow Analysis. Sage 100 Bank Reconciliation has a number of benefits for users. Keep your data safe by adjusting permission settings to control who can access and adjust balance entries, and deter check fraud by using Positive Pay. It saves you time by allowing you to automatically reconcile check information and easily make one-step bank transfers from the General Ledger. Maintain detailed financial information with the use of up to 2048 characters for comments on adjustment entries. You can also retain or purge detail after the reconciliation, which can help keep your system running at peak performance. To learn more about how to reconcile accounts in Sage 100, visit our blog or call the certified Sage 100 consultants at Accounting Business Solutions by JCS today at 800-475-1047.